Notre Dame Law School’s Program on Church, State & Society will award up to four summer fellowships, in the amount of $10,000 each, to students working for a religious institution in a legal capacity for the summer of 2018. New York Times columnist Adam Liptak mentions Professor Rick Garnett among the top legal scholars who have taken positions on the upcoming Supreme Court case. ND Law School mourns the loss of Paul J. Schierl, '57, '61 J.D. Paul J. Schierl, Notre Dame Law alum, friend, and benefactor, died on Oct. 23 at the age of 82. Notre Dame Law Professor Richard Garnett spoke at the CATO Institute's 2017 Symposium, titled "The Supreme Court: Past and Prologue," on Sept. 18. His talk was part of a panel called "Property, Religious and Secular." NDLS students Kristi Denny and Daniela Peinado, both 2Ls, participated in the Touro Law Center 4th Annual National Moot Court Competition in Law and Religion. The tournament this year was about the scope of the First Amendment’s "ministerial exception." The ministerial exception is a doctrine in religious liberty law that was affirmed by the United States Supreme Court in the 2012 case of Hosanna-Tabor. 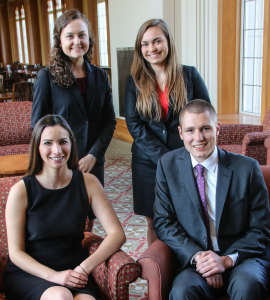 Clockwise from top left: Margo Borders, Lauren Andrini, Robert Sikorski, and Catherine Gawron are recipients of the 2017 summer fellowship awards from the Notre Dame Law School’s Program on Church, State & Society. 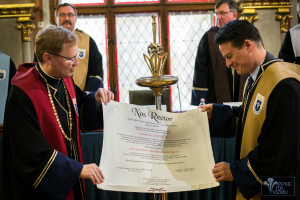 Pázmány Péter Catholic University awarded an honorary doctorate to Paolo Carozza, director of the Helen Kellogg Institute for International Studies and law professor at Notre Dame Law School, on March 27 in Budapest, Hungary. Professor Rick Garnett participated in WBUR radio broadcast show "On Point with Tom Ashbrook"
The Notre Dame Law School’s Program on Church, State & Society will award up to three summer fellowships, in the amount of $10,000 each, to students working for a religious institution in a legal capacity for the summer of 2017. The Center for Civil and Human Rights convened a Notre Dame panel on January 18, 2017 to discuss the historical development, possibilities, and realities of sanctuary as a civil strategy for the protection of vulnerable populations. Samantha Scheuler spent her summer at the Office of the General Counsel at the United States Conference of Catholic Bishops to gain a better understanding of the legal issues that can arise for a religious institution and how law and religion intersect in society. She also came to a better understanding of her faith.